Frederik February 04, 2012 Comment? 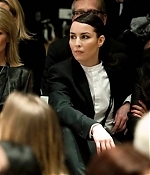 This week, Noomi has attended a couple of runaway shows at the Mercedes-Benz Fashion Week in Stockholm. A list of all appearances can be found below.